Hair extensions made from human hair can be heated (curled or straightened), styled, washed, and treated like your own natural hair. Hair extensions made from synthetic hair are sensitive to the sun, don't last as long as human hair, are difficult to style, and cannot blend in as well with your real hair. How do I choose hair Texture? This hair texture resembles Permed African American hair air dried or blown out. Most women who have permed hair will fall into this category of extensions. Even when hair is relaxed or permed it hardly ever gets Silky Straight, there will be residual kinks or curls that decided to "fight" the perm. This is why heavy flat ironing on high heat is necessary to achieve silky straight look, so if you want to prevent the heat, this hair texture will be great. Light Yaki is a very soft straight texture that is slightly coarse. 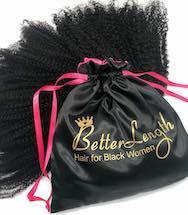 It is designed to blend with permed African American Hair. This hair texture resembles Natural 4a-4c hair blown out. Ladies with Perm hair can wear this also. 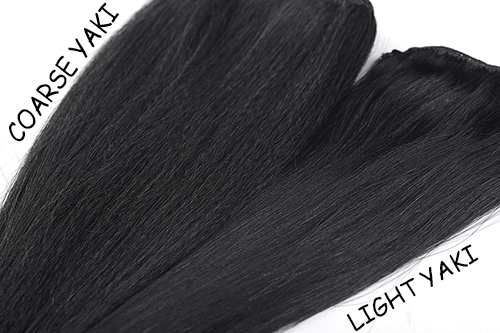 Coarse Yaki is a very soft and flowy texture which has amazing body and bounce. It is designed to blend with straightened or blown out hair. If you have natural 3c-4b hair then blowing your hair straight and then it will blend with your coarse yaki hair extensions. If you have 4c and 4z hair you may need to blow your hair out then follow with a flat iron on a low setting (Don't worry it will not cause heat damage on a low-medium settting). If you don't know what length to choose, just get a ruler or a measuring tape and measure from the top of the ear to where you want the extensions to reach and that is the length you should buy. For more information about how to choose length, please click here. How do I care my hair extensions? Please remember, our hair extensions is 100% human hair, so the better you take care of them, the longer they can be used. You can blow dry, curl and straighten your hair extensions just like your own hair, but keep in mind, they are human hair extensions, and they will damage just like your own hair. You should brush or comb the hair extensions through to get rid of any knots and tangles and use a heat protectant spray before applying hot curling and straightening irons. As hair extensions do not receive natural oils on the hair as your natural hair does, you need to apply a deep conditioning hair treatment to the extensions at least once a month to help keep your extensions in the best condition and ensure the longest life, which is especially important if you use heat styling tools on them frequently. As damage increases, it is also advised to have your extensions ends trimmed just like your own hair. Please keep in mind, the less heat styling to the extensions, the longer life span they will last. Depending on the usage of the extensions, we advise to only wash them every 4-6 weeks. Hair extensions do not receive natural oils on the hair as your natural hair does, they need moisture, conditioning and stay from chemicals and heat to stay soft and silky. Washing every 4-6 weeks will refresh your extensions from hairsprays and other product build-up. Washing on a regular basis is not advised, as it will strip your hair of moisture and color and dry them out faster. Always apply a deep conditioning hair treatment after washing and rinse in cold water. Please keep in mind, you should use a wide toothed brush and gently work your way through the hair. Do not brush with hard brushes or combs like normal hair the hair can be damaged. You can dye your hair extensions. It is advised to have a professional stylist dye them for the best results. For examples, if you have dark hair extensions, it is not advised to try to dye them platinum blonde. So if you must change the color of your extensions, get professional help first. We highly advise you to always go darker, since your hair extensions has been processed by several methods before you receive them. Hair extensions will get damaged faster with bleaching. Besides, semi-permanent hair dye is more recommended, because it is less damaging and does not dry out the hair as much as permanent hair dyes. How to apply clip-in hair extensions? We have a whole page dedicated to this on our website. For more information about how to apply clip in hair extensions, please click here. How long do BetterLength clip-in hair extensions last? The lifespan of our clip-in hair extensions is 3 months to 1 year depending on how often they are worn and how well they are taken care of. Can I dye BetterLength Clip-in hair extensions? If the hair texture you chose has the color options, then they can not been lightened or bleached because they have been dyed using permanent dyes, the color can hardly been bleached. But if the hair texture you chose has no color options except natural color, then it is okay to be dyed or bleached to achieve hair color you want. Normally bleaching is not recommended because it is a very damaging process and will lower the quality of your hair extensions and shorten their lifespan if you have not co-wash them properly. So It is advised to have a professional stylist dye them for the best results. Can I go to bed with BetterLength clip-in hair extensions? No. We do not recommend to wear your clip-in hair extensions while sleeping, as this can cause severe tangling with both your hair and the extensions, and can potentially ruin the extensions. For the same reason, we also do not recommend that you swim ,bath or take a shower with your clip-in hair extensions. Do BetterLength clip-in hair extensions experience shedding? BetterLength Clip-in Hair Extensions will have some normal and expected hair-fallout just like any other clip ins. You can minimize shedding, by maintaining your clip-in hair extensions with utmost care, and gently brushing them before and after each use. How often should I wash my clip-in hair extensions? Depending on the usage of the extensions, we advise to only wash them every 4-6 weeks. NOTE: Do NOT wash them unless you absolutely have to. How many packs should I pick, if I want to get a full look? It depends, usually one pack is enough. But if you like a lot of hair, two packs will be needed. The weight we mentioned on our website refers the total weight of the hair you will order without the clips attached. USA, Canada, Australia and most of European countries(such as UK, France). If you are from other the countries or regions, please contact us for more information. How long dose shipping usually take? Please understand that it will take us about 1-2 business days to process your order. We will email you a tracking number once your order ships. Approximate Delivery Times for Regular Shipping: 4-6 business days. The specific delivery time will be vary on countries, click here for more information. We accept payment by PayPal, credit card and debit card. All credit card, debit card and PayPal payments are processed through Paypal to ensure customer privacy and security. 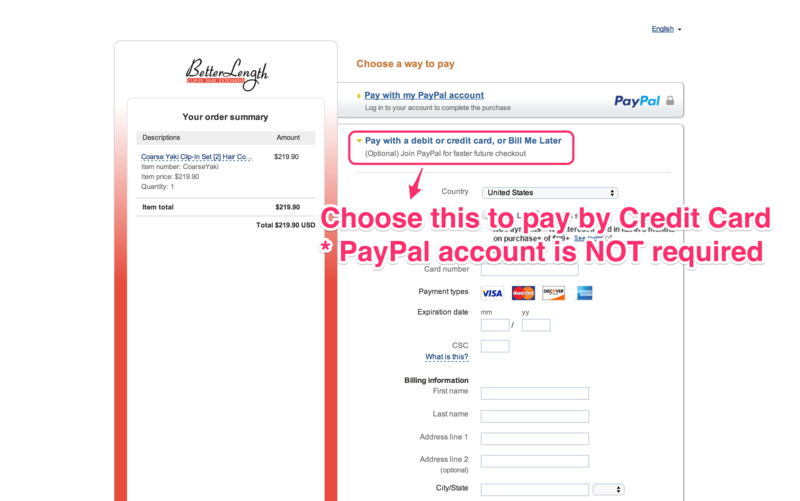 How do I pay with credit card, if I do not have a PayPal account? You can just click to checkout and then go ahead step by step. After you turn to the PayPal page as the following picture, Choose "Pay with a debit or credit card, or Bill me Later" and fill in your credit card information. Yes, For more information about our Return/Exchange Policy, please click here. It depends. Some coupons can only be redeemed by you and thus cannot be shared. If the coupon appears in your BetterLength account, the coupon may only be redeemed by you through that account and its associated User ID. Therefore, it cannot be resold or transferred in any way. If the coupons does not appear in your BetterLength account, it is possible you may share the coupon codes with others. Can a coupon be redeemed more than once? No, all of our coupons are limited to one-time use. Yes, all of our coupons have an expiration date, which is listed on the coupon. You will receive a refund for the entire portion of the purchase you paid for, but not for the amount of the coupon. Please note that coupons are not re-issued after the payment is reversed. Still looking for answers? No worries, we will help you find them. We respond every email within 24 hours.